Controls the daylight with one or more lamps defined in output objects. 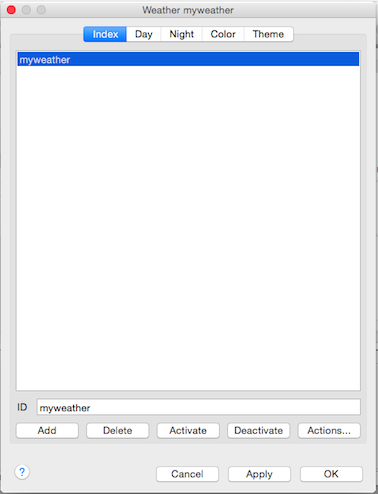 Unique weather ID which can be used with weather actions. Set the selected weather as default. This is also possible with an Action. The Output objects, linked to the lamps, to use for daylight simulation. The Output IDs in the list must be comma separated. The more outputs the better the result. The listed output order should be from east to west. Using an odd number of outputs will have the middle of the outputs located high south. Recommended is to order the outputs over the model railroad as a half circle. The segments between the outputs should be equally between all. The output objects, lamps, to deactivate in case of daylight simulation. Time in minutes between using the Noon color after sunrise and before sunset. Time in minutes between using the night lamps after sunrise and before sunset. This option slides the brightness from east to west which is only possible with at least 3 lamps. Minmal brightness for all lamps. this is a percentage of the lamp with the highest brightness. Use the times for sunrise, noon and day relative to the current model time. 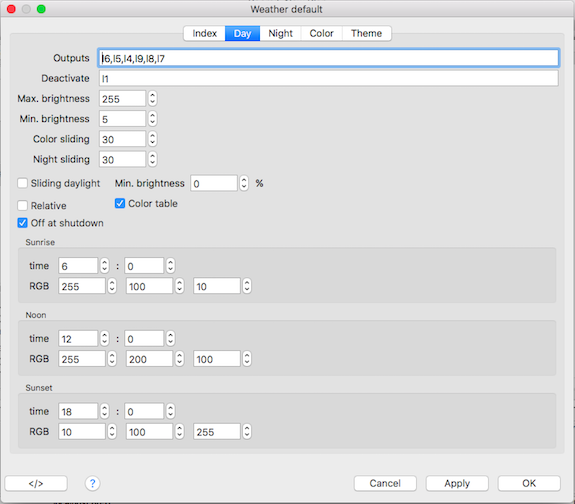 This option is only of use in combination with the setweather action and cannot be used with a color table. Defines the brightness of the daylight lamps in relation to the gliding sunlight lamps if 'Sliding daylight' is activated. Use the Color Table instead of the RGB values on this tab. The Sunrise, Noon and Sunset times are not used in case this option is activated. 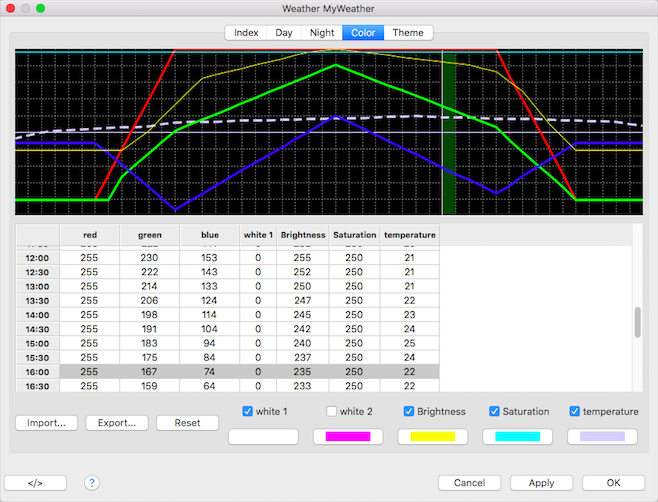 The sunrise and sunset RGB values are to/from noon calculated. The Output objects, linked to the lamps, to use for nightlight simulation. Do not use the same outputs as for daylight because till 30 minutes after sunrise and 30 minutes before sunset those outputs are controlled for night. The brightness of the nightlight. The color of the nightlight. The color table provides a RGBWWbsC value for every half hour of the day. The values used will be interpolated between two half hour value lines. At dialog startup the actual from/to hour range will be shown with a dark green background. Also the from hour row in the table will be selected. White White 1 DMX/RocNet only: Set to zero if the connected device(s) do not support a white channel. Purple White 2 DMX/RocNet only: Set to zero if the connected device(s) do not support a white second channel. Yellow Brightness (Dimmer) DMX1), HUE and RocNet. Steal Temperature Used as Fast Clock temperature. The line is dashed. A double click in combination with the pressed left shift key on a cell value will increase it. Use the Shift+Alt to decrease the cell value. The graphic will be updated after every double click. This functionality can be used for fine tuning. 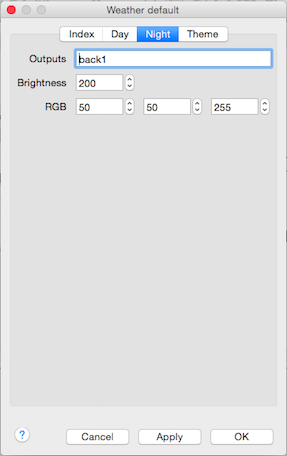 A double click on a row label will open the color chooser with the actual RGB value of this row. 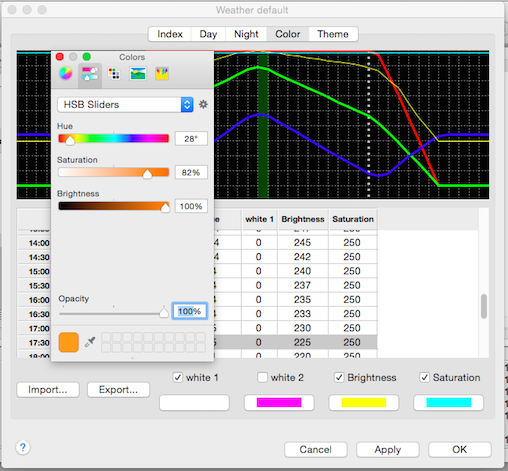 After closing this color chooser dialog the new values will be used for this row and the graphic will be updated. This will move the cursor in the graphic and select the corresponding table line. Import a comma separated file with RGBWbs lines with the line format as described under Export. Reset all color values to zero and the temperature column to 20°C. This effects only the graphical view of the color table and has no effect on what is send to output objects. The unique Theme ID in this weather. This can be used in actions. Optional lamp(s) for simulating lightning. Optional sound file to play at a random rate between 0 and 9. If the random rate is set to zero the sound is payed unconditional. 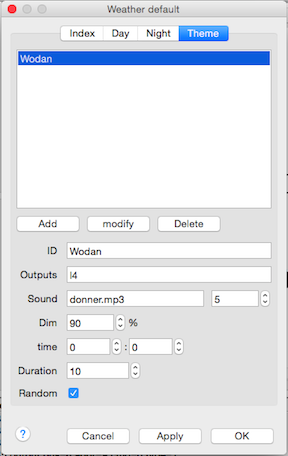 Instead of a sound file an output can be selected which can trigger sound on an external player. The sound path and player are defined in the Rocrail Server. Dim the daylight by this percentage. The time on which this event should be activated. The theme duration time in minutes. The brightness is set by the Output Value. Philips HUE Light (For better rendering.) Yes; Depends on lamp type. RocNet Pi03 Light Yes; Color support by channel bundling. OpenDCC BiDiB Light (For better rendering.) Yes; Color support by channel bundling. Mi.Light Light (For better rendering.) Yes; Depends on lamp type. Depends on the light type if a dimmer channel is available. Check the manual of the device.